The sport of Fullbore target rifle shooting was originally designed to encourage skill development and knowledge of shooting in general. Today we use single-shot, bolt action centre-fire rifles which are very accurate. Today's participants include both men and women of all ages from all walks of life and allows both purpose-built target rifles, 'scoped rifles, "free" class rifles and "match" rifles. Individual competitions are held at all levels in each class, from the Saturday afternoon Club shoot, to local prize meetings to state "Queens" and overseas events. Team competitions are held for Club pennant teams and district, state and national teams. The most popular calibre is .308 ( 7.62mm ) which in the hands of the best shots can achieve group sizes of less than 2 minutes of angle over distances between 300 and 900 metres, but the 5.56mm calibre is also competitive and is preferred by some shooters. Once the fundamentals are learned, much of the challenge is mental discipline and "reading" the effects of wind and light. At distances up to 900 metres, this can be quite a challenge! Shooting is carried out under national standard rules which ensure safety on the range and fair competition. "As with any sport you cannot be sure if you like it until you try it a few times." You will not need any equipment to try this the sport. 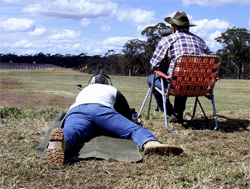 If you would like to try then please do not hesitate to contact your nearest club or the Victorian Rifle Association on phone 03 5449 3153, fax 03 5449 3954, email vra@vra.asn.au or post PO Box 5078 Bendigo East Vic 3550.